Pinner, R. S. (2011). A two year cross-section of student use of self-access elearning. Studies in Self-Access Learning Journal, 2(3), 170-181. Over a two year period of using a Moodle based self-access resource, student logins were measured against student numbers in schools in order to evaluate the percentage of students’ usage. Peaks in student use seemed to correspond with teacher training initiatives. This paper outlines these initiatives and the relationship between student use of self-access ICT resources and teacher training. It also details the types of training and incentives offered to both teachers and students to improve the usage figures of self-access. Many institutions are offering additional resources to learners in the form of eLearning content hosted on virtual learning environments (VLEs), thus providing enhanced opportunities for collaboration and access to a rich variety of multimedia materials. However, these resources are often underused and neglected by both students and teaching staff. The UK’s official body for inspecting schools, Ofsted, found in a survey of VLE usage that “the use of VLEs to enhance learning was not widespread and that the exploitation of VLEs at curriculum level resembled more of a cottage industry than a national technological revolution” (Halies, 2009, p. 1). There could be many reasons behind this lack of VLE usage, one of which might be the lack of proper teacher training. The present paper will examine some of the initiatives implemented in a chain of private language schools in the UK and Ireland which observed trends in student usage in relation to teacher training sessions. This study documents the design, implementation and development of a program of self-access with teacher-guided study. In particular, a VLE was used to host a wide range of online self-access materials. The program was implemented in a large chain of private language schools in the UK and Ireland. Throughout the implementation of the program, student use of the online self-access centre (OSAC) was measured and plotted into a graph. It was found that student use increased after teacher training and development sessions, which suggests teacher training and institutional support is an important factor in increasing the use of OSAC resources. This paper outlines the types of initiatives used to encourage teachers and how these possibly filtered back to students in order to promote increased use of the OSAC facilities. In particular, training emphasised practical ideas for implementing the VLE in class, as well as ideas for blended learning. Another focus of the training was general use of technology and Computer-Aided Language Learning (CALL) in class and ways of reducing the administrative strain placed on teachers by the VLE. Few teachers had used the VLE system previously and as those teachers who were responsible for the OSAC in their schools also had a lot of other duties including teaching, it was felt that spending a lot of time marking students work and running reports from Moodle might seem impractical without the proper training. The study attempts to illustrate that students are more likely to use OSAC resources if the teachers have been trained and given ideas about how to incorporate them into class. It also highlights the connection between teacher training and student OSAC uptake. Computer-based resources and learner autonomy have a close relationship. CALL can be utilised to provide increased access to a wide range of rich resources. For example, Benson (2001) cites the huge variety of media which allow students authentic and rich linguistic input. Computers feature heavily in many people’s lives, and as such language learners are likely to look to computers and the internet for resources. Figura & Jarvis (2007) talk about the long perceived relationship between CALL and autonomy, in their study they reported that students viewed computers as a useful part of their autonomous learning, with 62% if the subjects using the computer for between 1 and 2 hours per day for language practise. 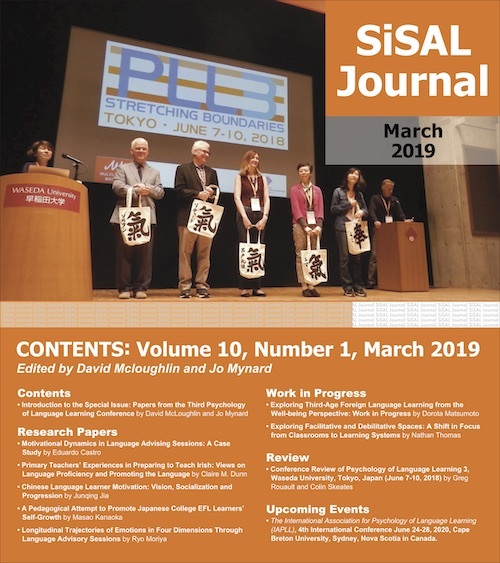 Self-access centres have featured heavily in language programs for several decades (Sturtridge, 1997) and OSACs are a logical development in that they enable greater access to a wider range of rich multimedia resources. As they are online they can also be tracked, monitored and edited by both students and teachers. However, the administration and navigation of VLEs are not always easy tasks, and training can all too often be inadequate for both teaching staff and students. This may be due to time constraints or inadequate follow-up training. These problems of teacher and student OSAC usage are additional to the task of encouraging students to be more autonomous. Autonomy is not the same as working completely without a teacher. A student who completes a pedagogic grammar course book without reflection or analysis is not working autonomously. Little (1991) equates total detachment to severe autism rather than autonomy. He states that “because we are social beings our independence is always balanced by dependence; our essential condition is one of interdependence” (Little, 1991, p. 5). For this reason, the present study attempts to examine any potential link between the support structures in place for teachers and students; in other words teacher training initiatives aimed at allowing teachers to support their learners’ self-access opportunities. A program of self-access with teacher-guidance was implemented as part of an initiative by Kaplan International Colleges to provide better support and autonomy to students who were studying in private sector language schools located in target language (English) speaking countries. The program featured a Moodle based OSAC with over twenty different quiz type activities per week over a ten week course with different levels of difficulty for Elementary, Pre-Intermediate, Intermediate, Upper-Intermediate and Advanced level students. All students were tested using an in-house test and placed into levels, once they began at the schools they were given access to the OSAC and shown how to login and navigate to the activities. There were also weekly written and spoken assignments which were based on the language content being practised that week in the OSAC. Each week had a theme, such as “The World of Work” or “Future Plans” and these themes formed the basis of any language work. The OSAC content did not relate directly to the work students were doing in class, so the OSAC work was to be treated as entirely supplementary study. In addition to the 10 weeks of activities on the OSAC, each school had a dedicated library of self-access resources ranging from graded readers to DVDs, with grammar books and other self-study materials. Each of these ‘study centres’ was managed by a study centre manager who was available to answer students’ questions and support them with their self-access learning. These study centre managers also provided any immediate technical support for the OSAC and were responsible for marking the online written and spoken assignments. The schools that participated in this study were located in the UK and Ireland. There were eleven participating institutions in total. The number of students who used the OSAC over the course of the two years (May 2008 – May 2010) in which data were collected numbered over 20,000. Data were compiled using reports which came directly from the Moodle VLE as well as student numbers from the student management system. The overall usage spanning the two-year period was plotted into a graph (Figure 1) using an equation to measure unique student logins to the OSAC against student numbers in the schools. The graph, which shows holistic uptake throughout all schools, shows peaks in site use around dates in which teacher training was carried out. A more detailed discussion of the findings will follow the presentation of the results. A graph was plotted from the results, which shows the student uptake of the OSAC and spans a two-year period with almost 20,000 students. The average uptake of the OSAC was 26.91% of the eligible student body, ie. those students who could have accessed the OSAC if they had wanted to. The subjects were students from a large number of different cultural and linguistic backgrounds. The ages of the students varied from sixteen to sixty, with the majority of students in their mid-twenties. Every student had different start dates and different course lengths, as the schools operate a weekly enrolment schedule and course lengths can be anywhere from four weeks to a year long. The disadvantages of having such a large variety of subjects and different enrolment periods will be discussed in more detail in the discussion section of this paper. The two types of training sessions which were conducted with the teachers can be broadly categorised as either general technology and OSAC class implementation training or specific OSAC administration training. The specific OSAC training was given initially to study centre managers whose role incorporated responsibility for the SAC and marking work on the OSAC, as well as student orientation and training to use both the SAC and OSAC. These study centre managers had a reduced teaching load and were scheduled to be in the SAC so that students could come and consult with them face to face if they needed any help or guidance. They were also responsible for running study clubs and workshops. A large part of these teachers’ jobs was connected with the SAC and its resources and events. Although the study centre managers had less engagement with the OSAC except for conducting weekly marking of online assignments, they were the only teachers in each school who would come into contact with the OSAC as a formal part of their job description. Training, which was specifically designed for study centre mangers, involved showing them how to run reports within Moodle so that they could view the amount of usage from students in their school. Unfortunately, this was problematic as the version of Moodle used did not support site-wide groups so a special hack had been implemented which was not always reliable. For this reason the training also featured an element of how to get around this limitation and how to gain more useful information specific to the school, making the training very focussed on technology and reports. Another important aspect of this training was that it attempted to justify why running these reports could benefit both the students and teachers. To illustrate this, the specific example used was that of students who ask to be moved up to a higher level class after a certain period of time. The schools all conduct summative level tests every five weeks to decide if students are ready to move up, but often when students fail the test they request to move up despite their results. It was suggested that students’ level of commitment and usage of the SAC and OSAC be a deciding factor in whether these students be allowed to move up to a higher class. Also, if the students’ requests to move up were denied, it was suggested that the students be encouraged to utilise the SAC and OSAC more to improve their language level in order to move to a higher level. Incorporating this directly into the training made the administrative aspect of the site more relevant to the study centre manager’s role. The second type of training focused on general CALL usage and was targeted at all teachers in the schools, even those with no dealings with the SAC or OSAC. The training was not specific to the OSAC although there were continual references to encouraging OSAC usage outside of class and also ideas about how to use the integrative features of the OSAC (such as the forums and blogs) as part of a class. Previous to these training sessions, most of the teachers had never had any contact with Moodle nor had they been fully informed about the features of the OSAC available to the students. Many were unclear in general about the self-access resources, and this was also incorporated into the training. In this way, the training featured heavily in both technology usage, SAC and OSAC resources and ways to encourage students to use these resources and to attempt to foster more autonomy with their classes by promoting the self-access resources. 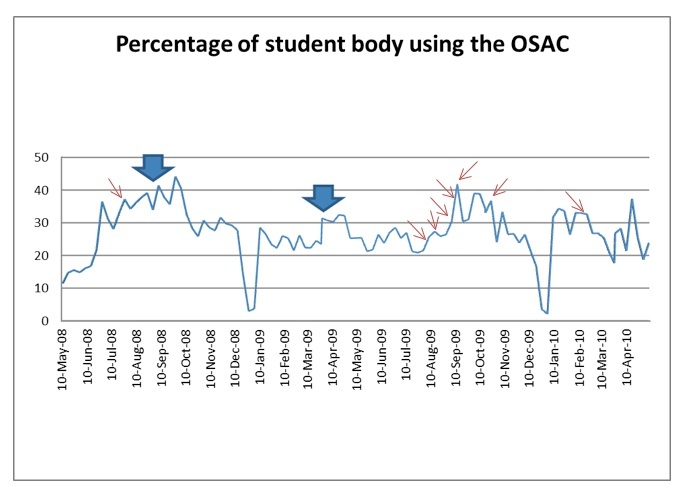 Figure 1 is the graph which was produced from the spreadsheet to show the percentage of student uptake of the OSAC. Training dates are indicated by thick arrows for centralised OSAC specific training and thin arrows for Technology training at individual schools. There was a high concentration of the second type of training sessions between August and October 2009 because the training session was very popular with teachers and other schools started specifically requesting the training. Table 1 shows the training dates from 2009 to 2010. The average level of OSAC uptake was 26.9% of the eligible student body(Table 2). This means that throughout the two-year period, roughly 27% of students with OSAC access were logging into the site to practise and make use of the learning materials on a daily basis. However, this figure is based only on unique logins and does not account for the time spent in the OSAC or the number of activities being attempted. In other words, we only know that students logged in, we do not know how much they used the resources. This would hopefully be incorporated into future studies providing improved reporting facilities in Moodle and better data collection methods could be used. The highest period of uptake was in September 2008, which was three weeks after the first OSAC specific training session in which all schools took part. Part of the training given at this session involved changing the way students were inducted on the first day so that they were given an OSAC orientation whereas previously they had only been informed about it. The lowest period of uptake occurred during the winter holidays, during which many students returned to their home countries and the schools were closed for two weeks. It is important to note here that because the study was conducted in private language schools, summer is the busiest period and there are no school closures in summer. Results over the two-year period (May 2008 – May 2010) are shown in Table 1. 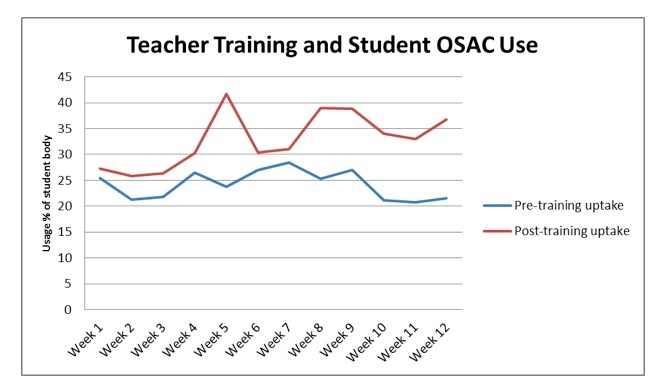 To represent the difference teacher training made to student OSAC usage visually, a twelve-week period was selected in which no training was conducted and plotted against another twelve week period in which five separate types of training were given across the different institutions (Figure 2). From these results it seems that students use the OSAC resources more if the teachers have been given training on the use of these resources, the types of activity available and the way the students can utilise them for self-study. One of the limitations of this study is the lack of qualitative data into the students’ and teachers’ perceptions of the OSAC resources, and this will have to be addressed with further research. Because of the large data set in this study, it is only possible to make very preliminary assumptions which would need the backing of more detailed empirical evidence to make more definitive observations. The main finding behind this study was that teacher training led to increased student OSAC usage. However, in order to test the link between teacher training and OSAC uptake more directly, qualitative data would contribute further insights into these findings. Also, using a smaller group with the same students throughout the study would make it possible to conduct statistical reliability tests to ensure there was a significant difference. Because every week each school had a new intake, it is not possible to statistically check the results from this study using ordinary tests for statistical significance. Therefore, for future studies it would be recommended to use a smaller scale data set and feature more qualitative data for information relating to student motivation and autonomy. Another limitation is the range of subjects. It would have been very interesting to be able to see whether students on shorter courses used the OSAC more than students on longer courses, or to measure peaks in longer term students’ OSAC usage. This is one of the main limitations of this study, as most of the data were collected after the student’s courses had finished and the study was put together retrospectively based on observed trends in a graph. Further studies could address this limitation by conducting interviews with participants and using a smaller sample so as to be more manageable and trends in students with similar length courses could be observed. Although this study is limited in that it only shows rough quantitative data relating to the number of OSAC logins, there does seem to be an indication that the more teachers know about OSACs and how to incorporate them into class and to make recommendations to the students for self-study, the more likely they are to encourage their students to use them. It also shows that the students are more likely to study using self-access resources if they are informed about them by their teachers. Continued teacher training and support would seem to be highly important to student self-access usage. Richard Pinner is a part-time teacher at Sophia University and an eLearning consultant for engnet-education. Benson, P. (2001). Teaching and researching autonomy in language learning London: Longman. Little, D. (1991). Learner autonomy. 1: Definitions, issues and problems. Dublin: Authentik. Reinders, H., & Balcikanli, C. (2011). Learning to foster autonomy: The role of teacher education materials. Studies in Self-Access Learning Journal, 2(1), 15-25.